Korean Gender Café 한국 젠더 카페: Does "Get your arse out, mate" Trivialize Sexism, Street Harassment and Survivors? Does "Get your arse out, mate" Trivialize Sexism, Street Harassment and Survivors? The Everyday Sexism Project aims to document “experiences of sexism, harassment and assault to show how bad the problem is &create solidarity.” How does The Guardian's Leah Green work to that end by targeting random men in the street? The idea of “turning the tables on men” grabs attention, for sure, and we’ve seen very successful scripted videos like OppressedMajority that speak volumes about sexism and street harassment without, actually, harassing anyone in the process. 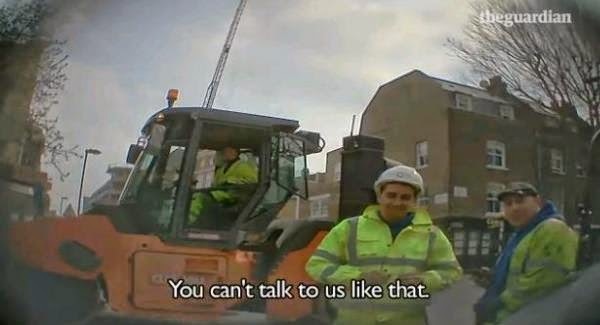 Maybe the Guardian video can even been seen as a platform to make people hear the words that have been used against those contributing at Everyday Sexism Project. Great, but that can be done by other means. Having watched the video, I cannot get behind the method. First, and most importantly, NOBODY should be spoken to in ways that make them uncomfortable or are intended to intimidate, humiliate, shame, etc. 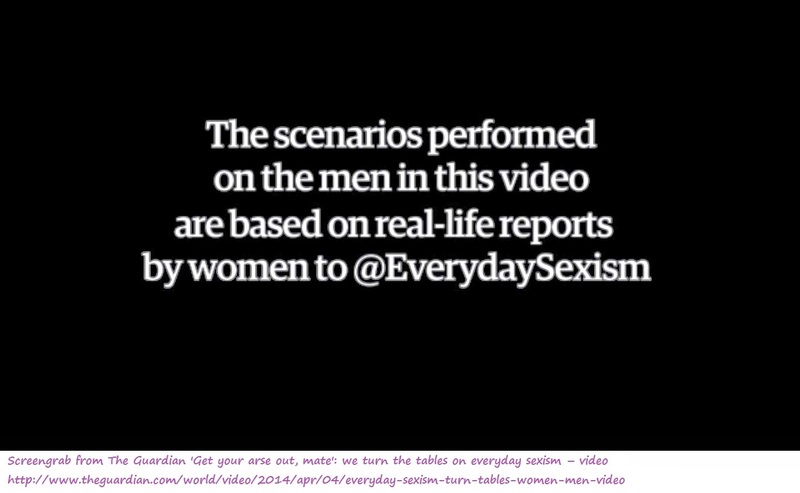 The Guardian’s Leah Green does not work for Everyday Sexism, but “performed” scenarios inspired by the project on men. Let’s unpack those euphemisms a bit. The Guardian/Leah Green read real accounts of sexism and harassment, and decided to pick random unsuspecting men on the street and “perform” intimidating actions, harassment, and hate speech on them. I have been harassed on the street, I would absolutely abhor seeing my story as a ‘scenario’ ‘performed’ on another human being. Second, the scenarios do not necessarily promote awareness of sexual harassment or street harassment and in turn may even contribute to homophobia or trivializing street harassment survivors. When Leah Green drives by and catcalls out the window, did that teach anyone about the harm? Worse, when Leah Green targets and asks pairs of men if they have "ever made out," the Guardian reporter is making big assumptions the men being asked, such as about their sexuality. The segment absolutely overlooks the reality that gay men and trans men and others also suffer street harassment. Further, in the minds of the men being asked, or folks watching the video, the ‘scenario performed on’ the men in the video may either trigger memories of other times they have been targeted for harassment based on their sexual and/or gender identity. Or, rather than promoting awareness about harassment, the question could spark socially heteronormative or homophobic responses, rather than clicking so that they 'get' how this question connects to street harassment of pairs of women. The Guardian comes off as policing masculinity and echoes hate speech that some LGBTQ viewers may have experienced, rather than educating anyone about the Everyday Sexism Project. Third, the randomly selected men are not necessarily those that attack women that contribute to the Everyday Sexism Project site. We don’t know anything educational about this project, it’s method, etc. we don't know what was explained to these men that were "performed on" or what opportunity they had to learn from this experience. How does that build solidarity, which is the aim of the Everyday Sexism Project? How seriously are the media taking this issue? 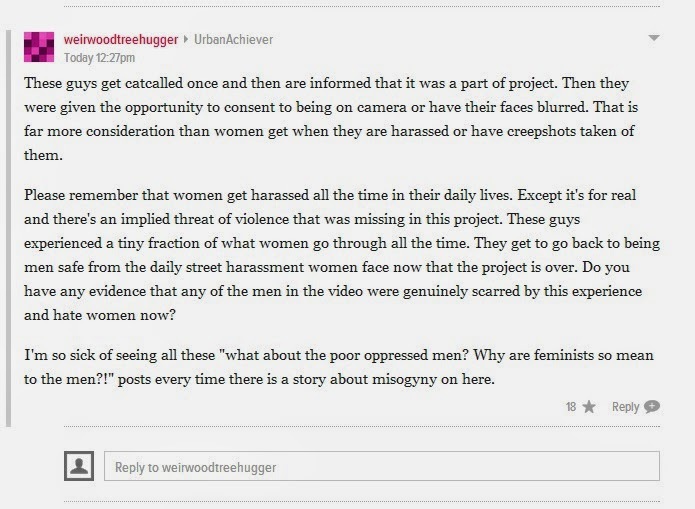 How well does the Guardian understand street harassment? Does the video come off as retribution or as a public education project?